That cake is currently baking in my oven. Originally I started making notes just to remember which recipes I like in cookbooks, then to note changes that were both successful and un-. Since my grandmothers died, my annotations are a way for me to project myself into the future. 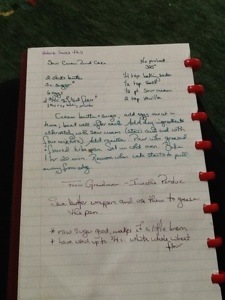 I know how much it means to me to have recipe cards in the handwriting of beloveds no longer around. I remember how much I loved pulling out the old, raggedy pieces of paper every Christmas with the recipes for fondue sauces and birds-nest candies. I hope some child in my life grows up to love to cook and will want all of my notes, the stained pages that mark a recipe used over and over. This entry was posted in Uncategorized on April 7, 2013 by vmohlere. One of my sister’s better ideas was to write down some dear family recipes, and make a notebook, with pictures from our childhood. There’s one scanned recipe card in my mother’s writing. It’s a smiley book. We have one of those that my aunt did, though sadly without scans of Grandmom’s handwriting. On that side of the family, though, one of my 250 cousins got the idea to do a family cookbook. They did a great job with the historical stuff. The thing is about 300 pages. Yours sounds great – please show it to me next time I’m up there!